If you need a convenient and organized way to tote around a few wine bottles at a time, pick up a few personalized wine totes and wine bags from DesignForYourWine.com. 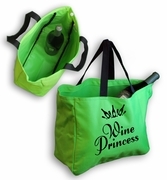 These sturdy wine totes and bags come in a number of attractive colors and styles. The basic personalized Wine Tote cinches like a potato sack so you can just grab it by the string and get going. It displays a graphic of a wine glass in front of a bunch of colorful grapes. You can add text both above and below the image. 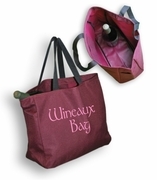 The Wineaux and Wine Princess tote bags are roomier -- you can throw them right over your shoulder and head out to your picnic. Volume orders available -- the more you buy, the less you pay for each wine bag. Choose your two favorite colors -- one for the bag and the other for the text imprint. You'll always find the highest quality Personalized Wine Totes & Wine Bags when you shop at TShirtHub.com.